Maybe you’re all set with your New Year’s Weight Loss Resolutions for 2018. Maybe not. Most of my friends weren’t too interested in creating New Year’s Resolutions, but something called to me. I wanted to mark the completion of 2017. I wanted to set the tone for 2018. I’ve been going through a lot since beginning My Tales From The Scale, and finding a way to honor 2017 and also set the stage for 2018 felt like the right thing for me to do. 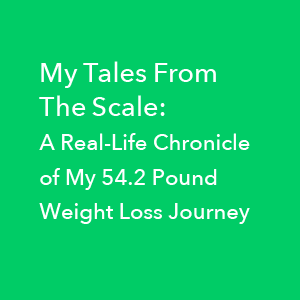 In 2017, not only did my mother (who is suffering from Alzheimer’s) come to live with me, but I also launched My Tales From The Scale, a program where I document my own private weight loss journey. There’s a lot to honor about 2017 and much to look forward to in 2018. As for the New Year’s Resolution process, I came up with something simple. Just a few steps. But powerful. Maybe you blew off setting New Year’s Resolutions or maybe you set them, but you’ve already veered off course. 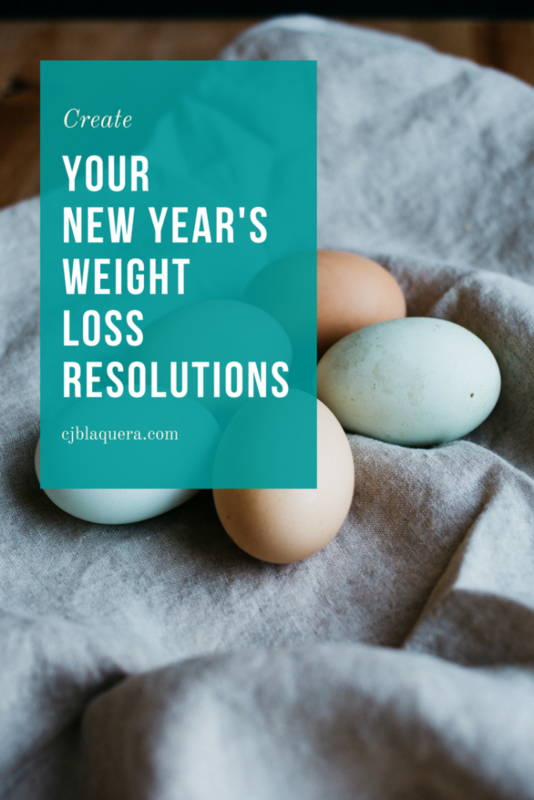 Either way, it’s not too late for you to try a new approach and craft your own New Year’s Weight Loss Resolutions for 2018. Here’s how I created mine. (Video and transcript below). I was looking for a way to complete on 2017, also, a way to step into 2018. I’m going to share with you what I came up with and, as a way of setting the foundation for that, I’m going to share a story about my Sweetie. I had taken my mom early in December to a holiday party with me. She and I went, and he really questioned whether I wanted to take her. She lives with us, and she has Alzheimer’s. I had determined that I did want to do that so I went, and I did it. I knew that it probably wouldn’t be perfect, and it wasn’t. It was challenging. This is hard. Of course, you feel pulled in every direction. Of course, it’s feels really hard right now. This is hard. So, when he told me that later, after the party, I was in full agreement with him, and it was so lovely that he took the time to purposefully tell me that he thought I had done something commendable. So, what I came up with for 2017 is what I’m calling a CT Scan. What I did was I decided to write down 100 commendable things that I had done in 2017, and I broke the list up into four categories: spiritual, emotional, mental, and physical. My plan was to have 25 in each of those categories, and I got to 203 commendable things, 203 items in my CT Scan of my life, my behavior, my actions in 2017. I offer that to you in case that’s something that you would like to do for yourself. It was amazing. It was a remarkable gift to myself to do that, to give myself my own acknowledgement and my own recognition. I’ll tell you, I was pretty detailed in some instances. For example, there is a type of oil, MCT Oil. That was broken down into four different things. Number one: I learned what MCT Oil is. I ordered MCT Oil, and not only did I order it, I actually tried it. And I had my mother try it, and we used the whole bottle. As I was doing it, I thought, oh my gosh you’re just really milking this here. You’re milking this into four different things, you know. But I realized also in those moments it is not a guarantee when — if you’ve ever bought a piece of fitness equipment or bought a gym membership or bought a series of classes, just because you found out about a product doesn’t mean you actually try the product. Just because you bought the product doesn’t mean you actually implemented and use that product or that you stuck with it for any amount of time. So, I really realized that each piece of that equation (learning about something, purchasing that something, and then trying something, and then sticking with trying that something) are all commendable aspects of that whole experience. I cannot take for granted that just because I learned about some miraculous diet that I’m going to actually do that diet. 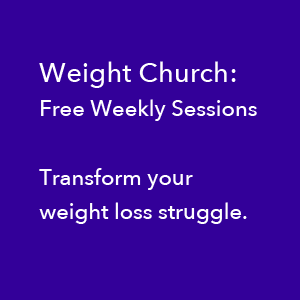 Or if I learn about something about the body that can help me to lose weight or become more fit or to have more vibrancy or health and fitness, does not necessarily mean that I’m going to implement whatever I’ve learned. So, each of those pieces is commendable, and I included those in my list. This is the year when my mother had a UTI,went into the hospital, and went into skilled nursing for 30 days and had rehab and came to live with me, and I moved her out of her apartment. I’ll tell ya, that’s several items that went on my CT Scan, and it was lovely to receive that recognition from myself. You might be interested in doing your own CT Scan for 2017 and taking a deep dive into what you did in 2017 that was commendable, that was honorable, that was brave, that was courageous, that was inconvenient and you did it, that was fraught with emotional pitfalls and you weathered them. You walked through them. Now, the second thing I did in moving forward to 2018 is I set to intentions for myself. It is my intention in 2018 to love myself at every weight. 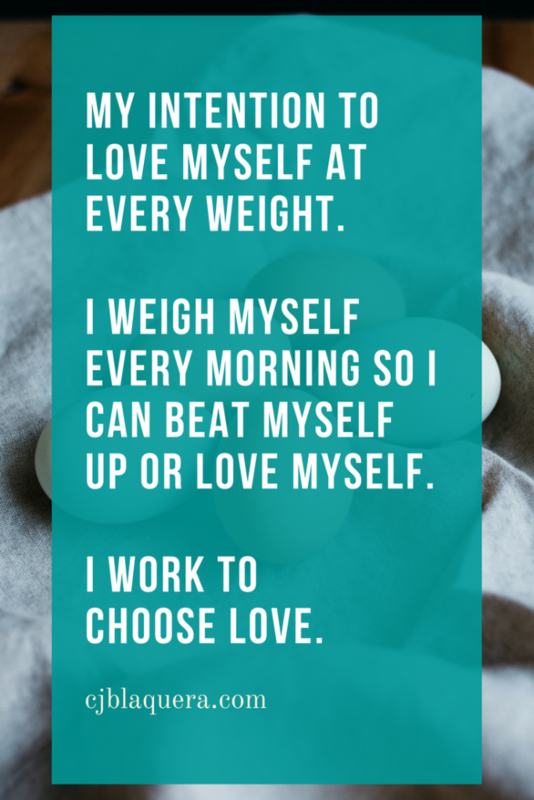 Now, I weigh myself every single morning so I give myself a daily opportunity to beat myself up or to love myself, to feel regret, shame, guilt, remorse, disappointed, and to beat on myself through all of that or to love myself through all of that. Now, because I’ve been doing My Tales From The Scale, I have really observed myself be so many different ways with myself. But I can tell you I did not start out on day one of My Tales From The Scale loving, actively loving and supporting myself at every single weight on every single day. So, that is my intention in 2018 — is to love myself fully and unconditionally at every single weight. That would be awesome; 365 days of that would be stellar. My second intention is to approach life with the belief, trust, and faith that life is conspiring for my highest good, for my highest honor, and on my behalf for my benefit. Life is conspiring on my behalf, and to live from that. That has been a philosophical idea that I was introduced to many years ago, and I have felt that especially about many things in my past, in hindsight, when I can see how they turned out already, but not necessarily as a living, breathing practice and intention on a day by day, moment by moment basis. As I say that to you, that feels kind of overwhelming to go 365 days like that, and I’m just going to love my way through it and do the very best I can. I don’t expect that I will be sheer perfection in the practice of these two intentions. I am sure though that my life will be completely different and better and transformed for having that intention and for having that North Star and that guiding light with me through 2018. Would you like to do a CT Scan, a scan of the commendable things you’ve done in 2017, a list of 10 things, 25 things, of 50 things? I started out aiming for 100, and I wound up at 203 and it felt good, so good to do that. What intention would you like to set, if any, in 2018 that sets the tone and the foundation for how you want to live and make decisions as you move into 2018, day by day. How do you want to face your day? Is there an energy and an intention that you would like to bring into being that helps you on a day to day basis, that you take with you into your day, into your week, into each new month? Where might you want to live from in the New Year? What intention might you want to carry with you? Learn more about My Tales From The Scale.